In May 1931, Richardson-Wayland sold the station to the Times-World Publishing Company and five years later, a Roanoke landmark pierced the sky. On May 10, 1936, WDBJ broke ground on a new transmitter building and tower. Engineers built a 312-foot tower in Colonial Heights, which can still be seen jutting from the center of Towers Mall. A two-story building for WDBJ’s new 5,000 watt “high fidelity” transmitter went up on the same 14-acre plot. Planners included an emergency studio and apartment for the resident engineer in the air-conditioned building. It was located in essentially the same spot where you now see Wachovia Bank on Towers’ upper level at Colonial and Brandon Avenues. The actual air studios remained in the American Theater, but not for very long. Any change in programming or location at the radio station was major news. A truly historic photo of the WDBJ staff in 1936. Ray Jordan is in the back row, 3rd from the left. 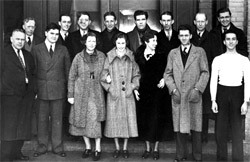 5th from the left is a young Irving Sharp and 2nd from the right is Hayden Huddleston. 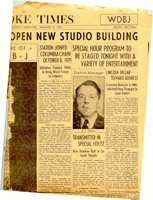 In June 1936, the station owners started construction on a $105,000 structure at 124 West Kirk Avenue that was to become WDBJ’s studios for the next 20 years. Designers had been working on the building for two years and needed six months to complete the construction. 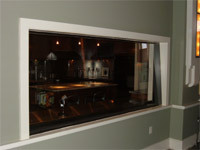 CBS engineers helped with the design that was reputed to be completely soundproof. According to Roanoke radio historian Steve Nelson, this was due to “the intimacies of construction. The studios…were vibration- free with acoustical qualities so accurately calculated that interference of human bodies, chairs, even music stands had to be considered.” Station offices were on the ground floor. Three studios surrounded a control room on the second floor. And the top floor held staff lounges and audition rooms for unknown talents to give station programmers their best tryout. This machine-age building has stood the test of time. 124 West Kirk still stands, and a small portion of the radio station’s studios and the art deco lighting have been preserved. When Will Trinkle moved into the building, he converted the studios into an elegant loft. The glass that once looked into the WDBJ studios now shows off the home’s kitchen! Charles Scott and his Harmonizers. The guitar player on the right is Lester Flatt. In the 1930’s, western swing music and western themes in clothing and books were all the rage, and the music on WDBJ followed right along. The Texas Troubadours were perhaps Roanoke’s favorite local western act. They joined national groups like the Sons of the Pioneers, the Girls of the Golden West, and Gene Autry. 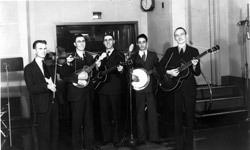 They played right alongside more traditional groups like Charlie Scott and his Harmonizers, who played in WDBJ’s Studio B. Believe it or not, Roanoke rivaled Nashville during this era for country music influence. In time, WSM’s “Grand Ole Opry” made Tennessee the center of the country music universe and WDBJ’s influence in Dixie began to fade. In just a few years, WDBJ would move something besides its studios. In 1941, the North American Radio Broadcasting Agreement changed the dial position for about 800 radio stations. At exactly 3:00 in the morning on March 29, 1941, the radio station moved to its current frequency, 960 AM. During the 1940’s, one of the radio station’s most enduring performers achieved national acclaim. Irving Sharp became known as “Mr. Dr. Pepper” because of his successful sales endorsements of the drink. He also hosted Sharp’s Daily Duzin’, Salt and Peanuts, and the Silver Dollar Man. “Cousin Irv” eventually went on to TV, hosting Cartoon Theatre and the Top of the Morning Show. 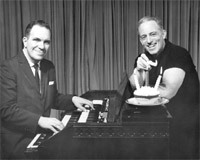 And for decades, he continued to host weekend music programs on the radio station that made him a star.